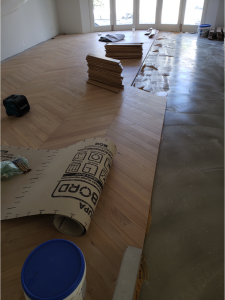 Supabord Temporary Floor Protection – The best solution to protect your raw timber flooring and surfaces. 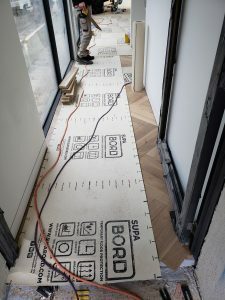 When you’re invested in a construction or remodelling project, you need to be sure that your floors and surfaces are being protected the right way with Supabord temporary floor protection. Some temporary floor protection products can work well across all flooring types, while others require more specific uses. But when it comes to raw and coated floors you need to be sure they are being protected the right way. Raw and coated floors must have breathable protection that will also protect them from scratches and scuff marks. Supabord technology includes permeable membranes, allowing the floor to breathe without picking up moisture, during jobs, or if it needs drying or curing time, being also flexible and made from rip-resistant material. SupaBord has incorporated the latest technology in floor protection, providing a balance of vapour permeability, durability, strength and safe workplace conditions in its product features. Supabord’s breathability and thickness is perfect for non-lockup job sites, where the breathability of the floor protection for raw timber is even more important as it will be expose partially to the elements. Supabord design allows vapour and moisture to evaporate, avoiding the surface to react to humidity, temperature, changes in moisture and direct wetting that could compromise the stability of the timber. Developed to withstand the demands of the construction industry our product is made from recycled paper, water resistant and is fully breathable. It can be used over almost all surfaces and has a unique joint tape to seal joints and is available for immediate delivery Australia wide to all HTH/M10, HBT and Independent hardware stores. It is worth taking the time to budget for floor protection as part of your overall project costs. Ensuring your flooring is protected with SupaBord during builds is vital and can prevent missed deadlines, over-spend on budgets and potential headaches.